Germany's massive car industry is the biggest investor worldwide in electric vehicles, a study published Monday found, as it scrambles under increasing pressure to adopt low-emissions technology. Over the past two years, German carmakers Volkswagen, Daimler and BMW announced 4.7 billion euros of investment worldwide in electric cars, the study by consultancy EY found. That far outstripped the 335 million invested by US manufacturers and just 19 million by Japanese firms. Adding up investments announced by the world's biggest 16 manufacturers over the past two years, Germany was the biggest destination with some 3.2 billion euros ($3.9 billion) poured into electric cars—far more than China's 990 million euros or the 887 million seen in the United States. 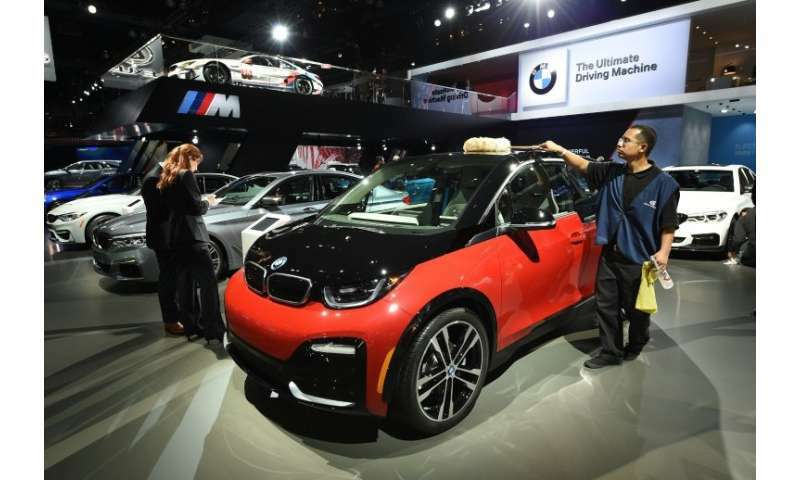 "The importance of electric-powered cars will grow considerably in the medium term," forcing automakers to ratchet up spending on the technology, EY car industry specialist Peter Fuss said. As elsewhere around the world, German carmakers have a slew of electric and hybrid models slated for release over the coming years. The sector has "taken its time" to get serious about battery power, Fuss said. But major spurs to adoption of the technology have emerged in recent years. In China, the biggest car market worldwide, manufacturers will from next year face stringent quotas for "new energy vehicles" as a proportion of their total sales. At home in Europe, pressure on the industry has grown after a series of scandals, including VW's 2015 admission to manipulating 11 million diesel vehicles worldwide to make them appear less polluting in the lab than they are in on-road driving. And a recent German court ruling that cities can ban the most polluting diesels from city centres to reduce harmful smog has set government and consumers clamouring for cleaner alternatives. Volkswagen is spending close to two billion euros to convert two factories in Germany to electric car manufacturing, while Mercedes-Benz maker Daimler plans a battery plant in the United States. German carmakers' sales of electric vehicles remain modest compared with competitors like China's BAIC, Renault-Nissan or Tesla, but they have hopes of gaining market share with several new models hitting the road in 2019 and 2020. Considering how little China has put into EV's, just look at how many are being sold, the wide variety and options... nowhere else in the world can you & will you see so many on offer. The German Auto sector still embraces Diesel and Hybrid variants and does minimal effort on getting Pure EV's to market. As for the American Companies, they are involved in China but keeping it there and not bringing it home, in fact they appear to be pre-setting for bailouts, guarantees, incentives & perks for when the rest of the world stands apart and their Fossil Fuel Powered vehicles have only diminishing returns and limited market space. Why would they invest when their government can be cajoled into forking out money for them to do what they should be doing in the first place, being proactive in their sector and evolving with the times.